Google Thewallinna and other creatures: I've found my perfect pattern designer! I've found my perfect pattern designer! Let me introduce you to Ralph Pink! I am more than enamored with his patterns; I am dying to make all of them. His patterns are modern, edgy, technically challenging and just perfectly drafted and put together! In fact, he used to work in a couture house but a few years ago launched his own brand of clothes and patterns. For some time, I thought that Named patterns would occupy a special place in my heart, but as much as I like their design I completely dislike working with their patterns. Such a shame, because the girls have great aesthetics ! About this Maxi Dress: I purchased the pattern six months ago but because of the hot weather, I was not inspired to make it. And then the first crisp autumn mornings combined with having to pack my fabric stash into boxes were the perfect succession of events: I dug out this beautiful panel silk jersey from Tessuti Fabrics and it screamed to be made into Ralph Pink's maxi dress. The pattern is very beautifully drafted: bust darts and four back darts for the shaping, the maxi skirt with the slit in front and the intriguing cut out on the back. All these ingredients create a perfect style for a new me :-) I am about to start a new page in my life and I feel the urge for drastic changes! Why not a big revision of my personal style and wardrobe? Having got rid of 60% of my clothes before packing, I am determined to sew a brand new wardrobe to fit my evolution as a seamstress but also as a woman. Ralph Pink offers only digital patterns and they come in multiple sizes. 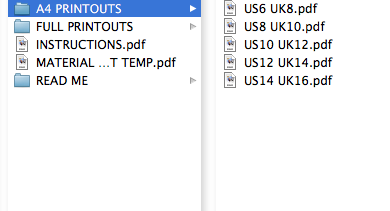 When purchasing a pattern, you can download a file containing a separate PDF for each size in both A4 and full formats. There is a separate document with instructions which without being overwhelming, contain just the right amount of information and pictures necessary to execute a project properly. 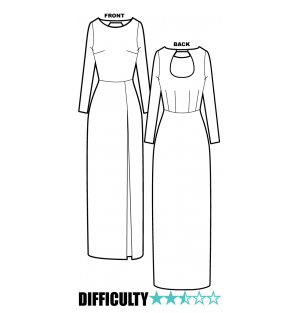 The instructions for the dress suggested to add a lining to create a seamless effect but I omitted it because the fabric would have been impossible to match. I just have to be careful to wear the proper undergarments. 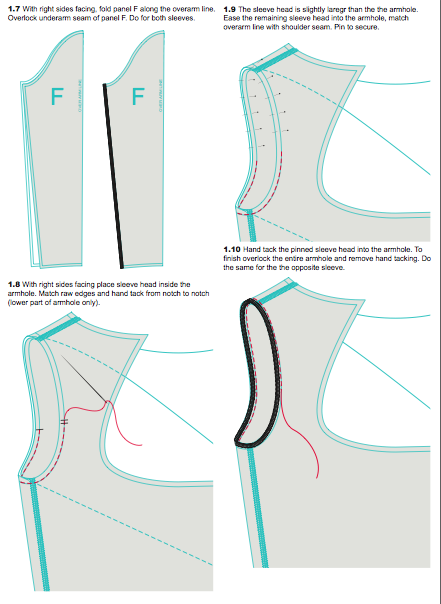 I had some troubles sewing this fabric, especially stitching the cutout and the neckline. Grrrrrrrr ...The latter has stretched a little bit even though I used the walking foot and tried to be very careful with not pull the fabric. Well, I hope to be better with the next Maxi Dress! And, of course, you can see a tiny bit of my bra! Needles to say, I am so looking forward to sewing more garments from Ralph Pink! You are sweet! You should check RP out! There are lots of gems in his pattern collections! hehe :-) Thank you, Leisa! I really sucked at the neckline, need more practice with delicate knits. YEAH, Ralph Pink's corsets are so yummy! God you look amazing Inna.Total transformation. I just love the way you have used this fabric. It makes an already interesting dress really pop. LOVE IT. Oh and now I have about 5 things lined up to buy as well! Love it-love the new-woman-ly you. Can't say I've had an awesome experience with RP though =P I bought one of his bra/bustier type dealy-os and the thing turned out not to be in the size range that was listed. So I wrote to him and never heard back. Pretty pissed off at that point so I never went back. Will be good to see what you make though. It's good that you've got access to the full format as well as the tiled (for when you get access to a proper printer ;). you look BANANAS. stunning!!!! i'm working on a ralph pink too, the other cocoon coat, but i've stalled out on finding the right trim. i love his patterns, and the fact that you can print off just one size, and the pretty instructions....yeah, crush. absolutely insanely beautiful dress, girl. Right? I am absolutely in love with RP! Although, i am curious about sewing tights and body glove :) Imagine my first day at work wearing the latter! Thank you, sweet Kirsty! Wanna swap for your sparkly skirt? The dress is stunning, I like the cutout detail and you used the fabric that makes it elegant yet not so formal. Never seen this designer's works before, must check it out. Too bad your love story with RP never happened :( I noticed that for the last 6-8 months they are being more active socially: FB and Twitter. Once I am in London I will go get Ralph and ask him to explain why he did not answered you! But, hey, my first projects over there will be RP and I'll definitely report about the experience. RE: Named. I wish they changed the way they present their patterns. What was your issue with the blouse? Thank you, dear Oona! (#^.^#) I want to sew the long version of the cocoon coat in thick wool so badly! So curious to see your interpretation of it! （＠´＿｀＠） thanks thanks. And check RP's patterns out! I am sure you'll find something for you there too! Wow! You are rockin that dress! Love Love LOVE how you used that print. Makes an elegant dress a bit edgy! I've been curious about Ralph Pink patterns to - yours turned out stunningly! Best of luck with your new style and new life chapter. I made the tuxedo jacket after seeing Cirque de bebes georgous one. It came to gether so easily and the instructions were great. Your dress looks amazing and I love your new do. Oh, he drafter some casual patters too! 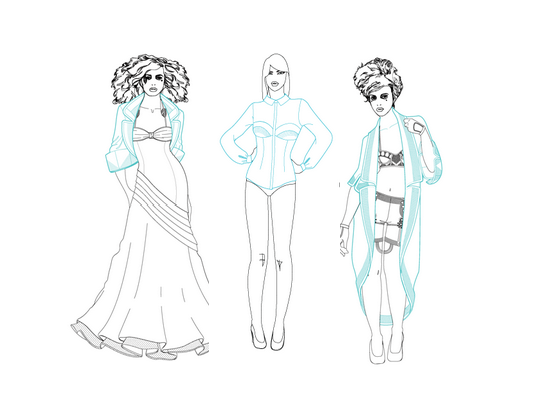 Check out a veiled boxer short, a double split skirt or a a camisole dress ;-) Only to name a few.. Thanks, Morgan! I think you should try some out. His patterns are a real pleasure to work with! Did you get a hair cut?! I didn't recognize your at first, and thought that you were the model for the pattern cover. I remember you mentioned that you would get a pixy cut, but this suits you so well! I love it and you look great! And the dress..I want one!! Gorgeous! I love the way you've used the print to emphasise the dress lines - it looks like they were made for each other! I love the shape of the dress and you certainly had a perfect day for the photo shoot! (is that Shinjuku gyoen I spy?) Having never heard of Ralph Pink, I'm certainly going to have to remedy that asap! ;-) Your hair looks so cute! I am still debating whether to go blonde or ginger... Hope you're enjoying your time off! No, it was Rikugien Gardens. Shinjuku gyoen is not so pretty :) I think you would look better in blonde! But hey, who said you should not try ginger too? Ahhhh! I thought it looked nicer than usual! ;-) Hmmmm! I've been both blonde and ginger, but as my hair grows so fast (!) I may go for ginger as it doesn't show the roots so quickly! I might just leave it up to the hairdresser...! Супер-оригинальная ткань и великолепное платье в итоге! Спасибо за ссылку на выкройки - я посмотрела, очень необычный крой, понравились идеи. Желаю вам успеха в их освоении и реализации! I wanna see it! Seriously, any colour would look great on you! You get a new haircut and new haircolour!!!!!!!!! I love the reflection about your wardrobe and the new woman you want to be, I can not wait to see your new projects! By the way the dress looks great on you!! Thanks for sharing the link, I did not know those patterns. Whoa spectacular! Love the wild print with the hair. You can definitely pull this off! I think I may have to try this pattern after seeing yours. I've got the RP kimono shirt taped up ready to go! Sometime. AAaarg you made me totally crush on the camisole dress!! So many sewing projects, so little time.. Why do I have a day job??!! Hi Inna, is that you? Just kidding! Love the cut and colour! And that 1 dress is worth more than 60% of the clothes you got rid of. If I looked that good in your dress, I'd never take it off. How awesome is it that you can print off whichever size you want?!! Kind of a simple & common sense idea really... but yay! for user-friendliness! What a smashing frock and RAD hair!!! ☺️ I promise to let you know when I do! I love your dress and the fabric (aside from problems sewing it) it is stunning - how you have used the print is to die for. Ralph Pink is added to my list! No, it's not me, it's my twin sister (kidding :-P). Please show us off your Kimono dress one you make it! I like the multi-size and multi-format patterns! YAY! Glamour is your new name! The hair, the dress, the new jacket in progress, all beautiful. Great job. He is so talented! I can't wait for his new patterns collection! 1) Great dress!! 2) I have been really intrigued with Ralph Pink patterns but haven't tried them out because I hadn't seen them sewn up by anyone else. Please keep blogging about them! Yes, try his patterns out! A real pleasure to work with! Stunning! And you look like a total MINX in this dress!